Durian fruit is a large, spiny, green fruit that comes from the durian tree. The fruit is sometimes referred to as the "king of fruits" because of its size and odor. 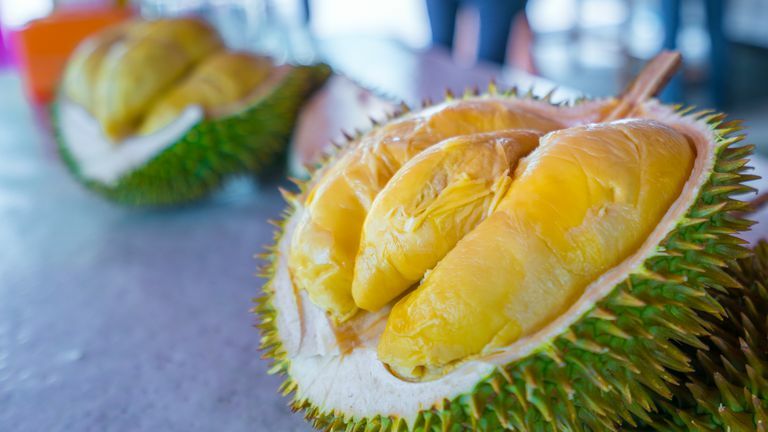 While some people in areas more familiar with the fruit (primarily Indonesia, Thailand, and Malaysia) describe the smell as sweet, most regard durian as having an intensely bad smell. The fruit is sometimes used as medicine, along with the bark and leaves of the durian tree. The fruit also provides nutritional benefits. There are 357 calories in a 1-cup serving of durian fruit. That is usually about half of the whole fruit. Although, many people consume a smaller amount, especially if they are new to its unique flavor. Most of the calories in a durian come from carbohydrate. There are over 65 carbs in a 1-cup serving. There are just over 9 grams of fiber per serving, according to USDA data. The glycemic load (GI) of a serving of durian is estimated to be about 24. Durian fruit is quite fatty for fresh fruit. There 13 grams of fat in a 1-cup serving of the fruit. USDA data does not provide information about the breakdown of fats in the fruit. Durian fruit provides a small amount of protein. A serving provides about 3.5 grams of the macronutrient. Durian is an excellent source of vitamin C, providing 80 percent (48 milligrams) of your daily recommended needs. You'll also benefit from healthy doses of vitamin B6, thiamin, riboflavin, folate, and niacin when you consume this fruit. Minerals in durian fruit include iron (1 mg or 6 percent of your daily recommended needs). Durian is also a good source of magnesium, potassium, copper, manganese, and provides smaller amounts of phosphorus, zinc, and calcium. Like many other fruits, the health benefits that durian provides come partly from the substantial vitamin C it contains. Vitamin C must be consumed in the diet because our bodies are unable to make it naturally. Vitamin C (L-ascorbic acid) is essential for good bone structure, cartilage, muscle, and blood vessels. It aids in the absorption of iron, promotes wound-healing, and it may also help to prevent disease. In fact, studies investigating the role of citrus in cancer prevention show that these fruits may provide a positive benefit. However, research is ongoing. The thiamin in durian fruit also provides important health benefits. Thiamin is important for healthy metabolism and helps convert the food you eat into energy—it's also important for the growth, development, and function of the cells in your body. Other micronutrients provide substantial benefits. Vitamin B6 is important for your metabolism (and in brain development and immune function in infancy), riboflavin is important for the growth, development, and function of your cells, manganese provides many benefits including wound-healing and bone development, and potassium is important for proper kidney and heart function, muscle contraction, and nerve transmission. How should I select the best durian fruit? You're not likely to find durian at your local market. Some Asian markets sell them and other big box grocery stores in selected parts of the country sell them at certain times of the year. When selecting the fruit, look for a bright color and no (or few) blemishes on the spikes. The stem should be moist and light-colored. Some sources recommend that you shake the fruit. If you hear something rattling on the inside that means the fruit has dried out and is no longer fresh. When is durian fruit in season? The main growing season for durian fruit is late summer to early fall. Why does durian fruit smell so bad? The pungent smell of durian fruit has been compared to smelly socks, and even to the smell of a dead animal. Scientists have determined that it isn't just one element, but a combination of different chemicals that are to blame for the smell. Each component that makes up the fruit provides a different characteristic smell so that when combined, this creates the overall smell that is so distinctive. Is it true that durian fruit is banned in some areas? Yes. In some parts of Asia, the fruit is banned on public transportation, in some hotels, and other buildings due to its odor. Durian fruit can be cooked or consumed raw. However, before you enjoy the fruit or use it in recipes, it must be removed from its outer shell. Some people enjoy using durian fruit in ice cream, cakes, or other baked goods, as it provides a distinctive taste to flavor any dish. To remove the fruit center, experts recommend placing the fruit stem side down on a sturdy counter. Then, slice into the spiny skin about 3 to 4 inches deep. From there, you should be able to use your hands to pull apart the skin and reveal the fruit. You'll see the fruit is divided into pods. Each has a pit or a stone that should be removed prior to eating. The taste and texture of the fruit are often described as soft and creamy. However, the flavor is so distinctive (and unlike any other fruits) that many new eaters don't enjoy it. Some experts recommend that you visit a durian farm to get the best fruit and eating experience. Durian can cause allergic reactions, and reports have been published of allergic reactions. However, other reports investigating allergic symptoms (such as asthma) have found durian to be less reactive. Always check with your healthcare provider if you suspect an allergy to this or any food. Thiamin. National Institutes of Health Office of Dietary Supplements. Fact Sheet for Professionals.